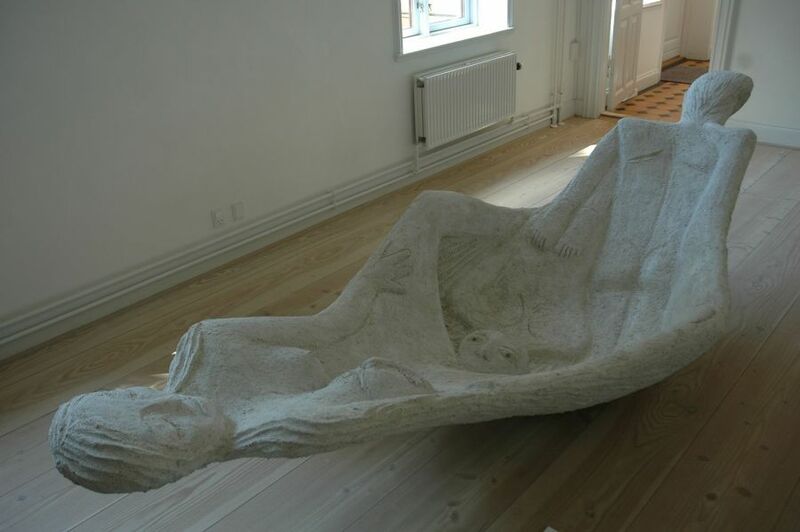 "Female Boat" is made out of cement. A woman who opens her loins, with men who are born or try to force their way in. She enjoys, provides or is used/abused. She is both safe as well as dangerous. The woman is a boat with her "passengers". The interpretation is intended to be very open. But could, for example, refer to women who come here dreaming of a new life and for various reasons end up in prostitution. With the sounds of an Arabic reading from the next room, one could also get associations of the debate about the position of women in many Muslim countries. But also the many abuses that take place in our own world - on many levels. The strong maternal figure and female power is also frightening and threatening in different ways in different cultures. On the ceiling above the sculpture there is a mirror. - both create a connection to another world." "The image in the mirror is the manifesting and temporal world and man's knowledge of himself"